Our Quarter Horse program is heavily influenced by the Thoroughbred. In fact we do have an Appendix QH mare that is bred for QHs. We are trying to have our QHs more to the racing type than anything else though we use old foundation lines in our herd to preserve that quality of our QHs. Twisted Mist Bar-1967 black. Sired by Tonto Bars Hank (r), out of Mist Twist (r). Bred by Shadow Wolf Stables. 1986-Speckled Zippo, black roan spotted blanket Appaloosa (x Justa Pagan -Appy) o/b Angel Haddock. Spanish Dream-1968 brown. Sired by Fort Piedmont (r), out of Washata Dream (r). Bred by Shadow Wolf Stables. 1990-Spanish Cowboy, chestnut colt (x Copper Cowboy) o/b ? Devilish Whiz-1976 dun. Sired by Marbar Leo Whiz (r), out of Devilish Claudie (r). Bred by Shadow Wolf Stables. 1995-Ain't Devilish, chestnut filly (x Ain't Goin Down) o/b Shadow Wolf Stables. 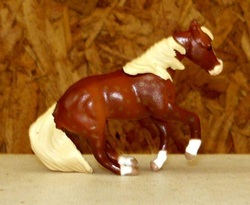 Tiger Stormtress-1973 chestnut. Sired by Tiger Leo (r), out of Cozys Cutie (r). Like A Diamond-1975 dunalino (palomino dun). Sired by Mr Diamond Dude (r), out of Pollyanna Rose (r). Full sister to Diamond Sparkle (r). Diamonds inthe Sky-1983 cremello dun. Sired by The Golden Wraith, out of Like A Diamond. The Red Wraith-1985 flaxen red chestnut. 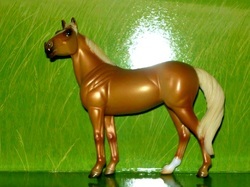 Sired by The Golden Wraith, out of Magbys Decka Lea-r.
Diamond Wave-1986 buckskin. Sired by Tsunami, out of Like A Diamond. Miss Colorado-1989 amber cream. Sired by Colorado Joe, out of Miss Tommy Raffels (r). Bred by Shadow Wolf Stables. Tidal War-1990 bay. Sired by War Drift, out of Diamond Wave. 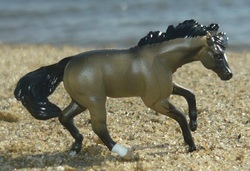 OF Breyer SM, para dressage. Ima Smart Spice-1990 palomino. Sired by Smart Chic Olena (r), out of Hot Spice (TB-r). Morning Desire-1990 gray (buckskin base). Sired by Sky Blue Walker (r), out of Money Grown on Trees. Bred by Caroline Spracklin. Diamonds At The Bar-1992 chestnut roan. Sired by Red Bar Eeddie, out of Like A Diamond. Bred with the help of Celtic Song Stables. 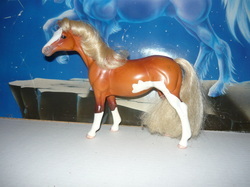 Lady Metal-1992 flaxen chestnut sabino. Sired by Prince Stanley-r (TB), out of Invest A Lynx-r (QH). 2005-Blaze's Essence, flaxen chestnut sabino filly (x The Golden Wraith) o/b Spur Star Ranch. Chip My Sweet-1993 bay. Sired by Zips Chocolate Chip (r), out of Sevens Sweetheart (r). Wiskadun-1993 smoky grulla. Sired by Page Bull Parker (r), out of Wiskachic (r). Dunit Twerp-1994 dunskin. Sired by My Little Twerp, out of Diamonds inthe Sky. Bred with the help of Pied Piper Ranch. 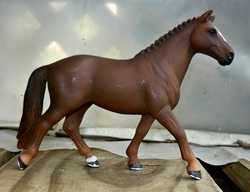 OF Breyer Classic AQHA mare. Shadows Payback-1996 bay. Sired by Texas Payback, out of Shadow Redemption. Bred by Shadow Wolf Stables. Lil Smokin Hornet-1997 palomino. Sired by Lil Jack Horner, out of Smoke Em Again. Bred by Indigo Creek Stables. 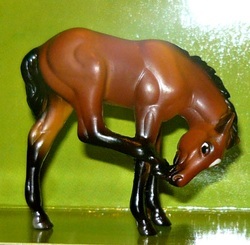 OF Breyer SM running foal. Zippo Witch-1998 flaxen liver chestnut. Sired by Zippo Pine Bar-r, out of Poco Bee Witched-r.
CM Cutting Horse done by Beth Hoffert in 1998. 2010-Witchy Woman, chestnut filly (x Invested Dimension-r) o/b Erica Jelen. Total Rio Chic-1998 liver chestnut. Sired by Smart Chic Olena (r), out of Gay Freckles Rio (r). C Me Creepin-1998 grulla. Sired by Lunar Salutations, out of Jessie Jane. Bred by Twin Springs Stable. Chip Not Dun-1999 bay. Sired by Zips Buckskin Chip, out of Dunit Twerp. 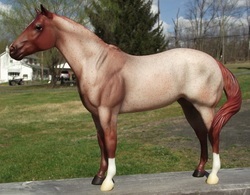 OF Breyer Classis AQHA mare. Ghostly Shadows-1999 black silver. Sired by Shadow Ridin Pine-r, out of Ms Barbarella-r.
Up Your Bleep-1999 grulla sabino. Sired by Bleep, out of Lady Metal. Bred with the help of Twin Springs Stables. Diamond Bar Gold-2000 palomino roan. Sired by Docs Golden Pride (r), out of Diamonds At The Bar. Ima Royal Fair-2001 bay. Sired by Kings Quest, out of Fly X Night. Bred by Twin Springs Stable. Diamond Payback-2001 bay dun. Sired by Smoke Dem Diamonds, out of Shadow Payback. Continental Twist-2001 black. Sired by Continental Knight (r), out of Majestic Twist. Bred by Shadow Wolf Stables. Smokin Hot Desire-2003 perlino. Sired by Smokin Hot Spark, out of Morning Desires. Bred by Shadow Wolf Stables. 2008-Smokin Hot Doc, buckskin colt (x Docs Chexing Out) o/b Shadow Wolf Stables. Figurative Shadows-2004 bay silver. Sired by Figure (TB), out of Ghostly Shadows. The Golden Twist-2006 palomino. Sired by Little Bit Of Smarts-r, out of Originaly Twist-r.
Delt My Gold-2007 palomino. Sired by Docs Golden Pride (r), out f Delta Denim (r). Loco Im Steady-2009 flaxen chestnut. Sired by Let's Go Steady, out of Poco Loco. Bred by Crissi Goreham. Silver Diamond-2011 buckskin silver. Sired by Silver Pine, out of Diamond Wave.